Lindy Lee is an important Australian artist who has been exploring the art of photocopying for a number of years. In the late 1980s early 1990s the photocopy took over as her predominant mode of art practice. During this period Lee took iconic images from the history of art and repeatedly copied them, at times obliterating the image with layers of carbon and paint. 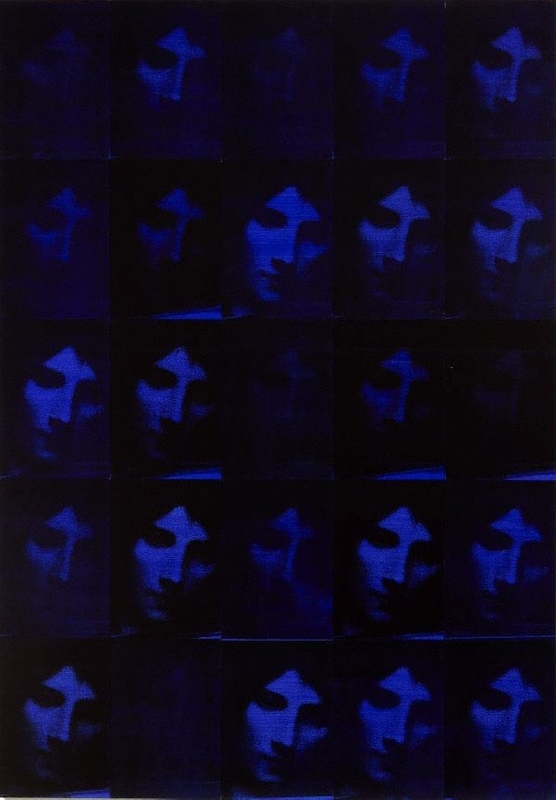 'Dominion' 1994 is a quintessential blue piece from this period. Through repetition and seriality (characteristics of Minimalism) Lee regains the power of the original image that she copies. Invoking the process of peering through the layers of varnish and dust that coat these paintings in the original, Lee's photocopies endlessly replay the joy of discovering the first image. Lee has spoken of the embodiment and disembodiment of the image, implying that the rectangular unit in her grids can be filled up or emptied out as the image both arises from and is anchored to the material. There is a continual flow of negation and affirmation in these works. Signed and dated verso panels [a-y], black marker "Lindy Lee 1994". Wayne Tunnicliffe, Contemporary: Art Gallery of New South Wales Contemporary Collection , 'Cultural memory, critical distance', pg.154-203, Sydney, 2006, 178 (colour illus. ).